"Napco’s ability to develop the custom finish I am looking for is just amazing. On top of that, the finished product is beautiful and my customers have been very impressed. Everyone at Napco is pleasant and easy to work with. Thanks for all you do to make my designs look better than even I imagine." Napco Painting Contractors is a full service painting company. We keep up to date with new products and techniques within the industry. You can be sure we apply our specialized skills, craftmanship and attention to detail to every project. We offer several different services. We know your home is most likely your largest investment. It's important to maintain and protect that investment with quality painting maintenance whether it be interior and/or exterior. With Napco painting you can be sure that we will take extra precaution to protect your property. We take the time to be sure your home is painted to your expectations. We know your business keeps you busy. We offer flexible scheduling, low-odor paints and color consultation. We will have your building looking fresh and new in no time with little to no effort on your part. We paint wineries, offices, schools, places of worship, hotels, resorts and retail centers. 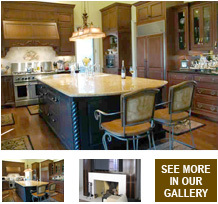 We provide fine finishing to many general contractors, cabinet builders, designers and home owners. We us up to date techniques and products that allows us create custom designs and colors. We database all our formulas to help ensure future touch-up match. Our facility allows us to keep our production running efficiently with a fast turn around. The finish shop specializes in the application of conversion varnish. Conversion varnish is a two part catalyst system, that results in an extremely durable furniture grade finish. The life of conversion varnish is longer than that of most lacquers and/or standard top coats. The project and type of finish chosen will alter each scope of work slightly. Listed below is a general sample of our finish shop scope of work. We offer several different coatings. We offer several artistic designs. Work can be done on site or in our shop, again depending on the type of project. Also fine finish is not limited to just cabinetry. We can also give you that special look on furniture, mantels and beams. Your imagination is the limit. Whether you have a beautiful winery, estate property or residence, we offer a full range of paint maintenance services. We can create any type of schedule to suite your needs. We can revive and protect the appearance of your property with scheduled power washing, general painting, touch ups and/or preservation of natural wood surfaces. Each property maintained has a dedicated foreman assigned. We feel this is very important to the service you receive. Not only will you have a friendly familiar face to be in contact with, but also comfort in knowing that your foreman is knowledgeable when it comes to the history of the property maintenance. You can be sure your property will be in safe hands. We are proud to provide you with premium quality and take value in our work. Gaining your trust is vital to our success. The best way to do that is to guarantee the quality of our work. We have provided a copy of our guarantee below. A defect in any workmanship as it applies to our application of all products and materials. Handrails and decks are to be covered for 1 (one) year. ALL DEFECTS MUST BE REPORTED IN WRITING AND VIA TELEPHONE UPON DISCOVERY. NAPCO WILL IN TURN RESPOND WITHIN THREE DAYS TO SCHEDULE AN ONSITE VISIT TO EVALUATE ANY POSSIBLE DAMAGES AND REPAIRS. Maintenance cleaning is vital to the overall service life of a painted surface. However when selecting a cleaner, be sure to use a non-abrasive cleaner. If cleaning a waterborne paint, avoid products that have ammonia in them. Mild soapy water generally works best on all surfaces. Remember always test a cleaning solution on an inconspicuous area first to ensure it does not damage the paint or finish.